Brexit confirms that the EU is not a super-state in the making but rather an advanced regional organization. This book bridges the gap between EU studies and international relations by providing a student-friendly presentation of regional, multidimensional cooperation among neighbouring states and societies, its four epochs and relevant variations and similarities across five continents, its interplay with globalization, and the changing post-hegemonic and post-Cold War international order. 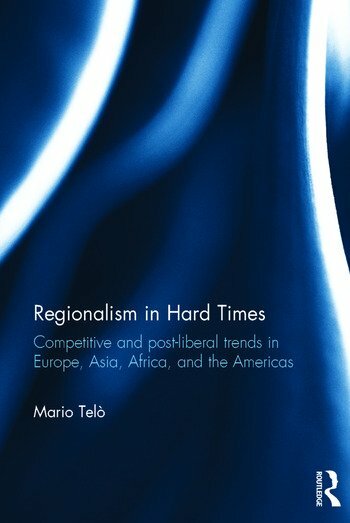 This text secondly focuses on the question of regionalism in hard times: whether the global financial crisis and multipolar power politics are leading to more competitive and political forms of instrumental regionalism and interregionalism in Europe, East-Asia and the Americas. It does this by addressing the political and strategic dimensions of changing regional/interregional arrangements and their current and potential impact on global governance, notably on trade and security challenges. Mario Telò is professor of International relations at LUISS and Jean Monnet Chair at the Université Libre de Bruxelles. He is also a member of the Royal Academy of Sciences, Belgium and the editor of EU and New Regionalism.